I was fortunate enough to be able to post this response to one of Ken Ham’s claims during his debate with Bill Nye on God of Evolution. It’s an excellent blog that everyone interested in the science/religion conversation should read regularly. 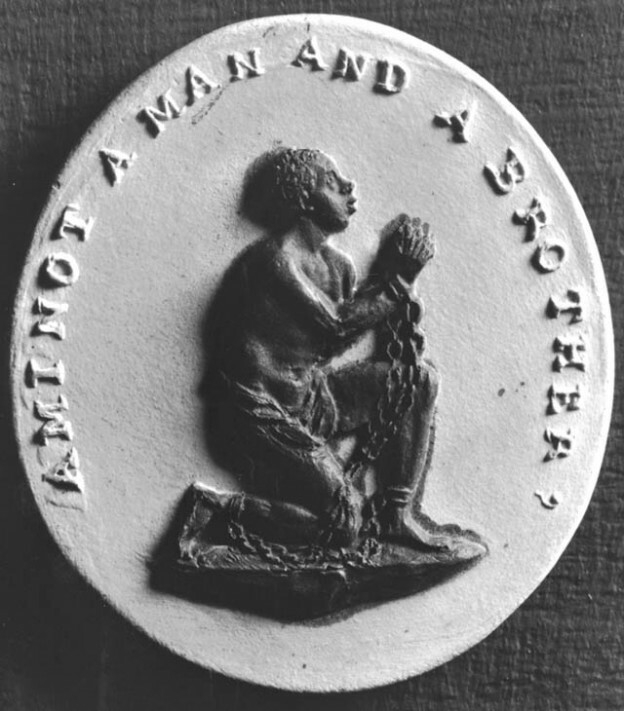 The pottery medallion created by Darwin’s grandfather, Josiah Wedgwood, for his anti-slavery campaign. The debate between Ken Ham and Bill Nye the other day surprised me in a number of different ways. I wasn’t expecting much at all and I was bracing for a train wreck. But the debate turned out to be quite civilized and the interactions between the two interlocutors were respectful and well-mannered. In regards to content, they both did quite well presenting their cases. Ken Ham was kind of all over the place, especially towards the end, and in contrast to Bill Nye’s factual and pragmatic case for the scientific superiority of evolution, attempted to build his argument as much on theology and ethics as on science. But while The Science Guy’s easy to understand presentation of science was strong, his comments on religion, especially the Bible, were woefully ignorant. Also, Ken Ham had better PowerPoint. I doubt any minds were changed by the debate. If you thought any one of the debaters won, you were probably rooting for the guy to begin with. One thing I’d like to acknowledge, though, was the generally positive nature of Ken Ham’s presentation. Those familiar with creationist arguments — perhaps especially those on the receiving end of said arguments — know well how negative, fear-mongering and demonizing they can be. Ken Ham could easily have resorted to such tactics and scored culture war points with his audience. But he didn’t. As Ken Ham went through the scientific predictions he argued creationism could make, he claimed that creationism predicted that human beings are all one race (a point related to the “kinds”-argument and microevolution made just before). Since we all can trace our ancestry back to one set of gardening parents, we are all the same race. Which is fair. What was not so fair was his characterization of evolutionary theory as essentially racist. Some 46 minutes into the debate, Ken Ham makes this claim: Evolution, as expressed by Darwin in his book“The Descent of Man” and later taught to unsuspecting American school children, supplies the logic required to segregate human races according to higher and lower worth. It was only after Craig Venter’s alternativehuman genome project, Ham claims, that secular science found out what biblical creationists had always known: There is only one race — the human race. Ken Ham presents this as going against evolution as expressed by Darwin. This was more than a century before Venter. Darwin brought this moral indignation with him as a young explorer on his voyage on the Beagle. There he witness the horrible mistreatment and torture faced by slaves in South America. Desmond and Moore argue, somewhat controversially, that it was Darwin’s passion against slavery that lay behind his writing “On the Origin of Species,” and later “The Descent of Man.” Convincingly arguing for and publicizing the theory of evolution was, for him, not merely a scientific pursuit, but a moral and social one as well. In the face of evolution, no one could claim that certain races could lay claim to the title and associated benefits of “humanity” over against another, who they then could enslave. No matter differences in appearance, common descent unites us all and is the foundation of basic human equality. For Darwin, evolution made slavery impossible. Christians would want to say more and root human equality, dignity and rights not in common descent, but in the Imago Dei. But we should recognize and celebrate how Darwin viewed his theory and encourage such a helpful interpretation of it. Obviously, a cursory familiarity with history demonstrates that things haven’t been as simple as Darwin hoped. Evolution was subsequently used by eugenicists and others to support their racist ideas — just as Ken Ham mentioned with his reference to a 1914 biology text book. But such sentiments weren’t based on, as Ham said, “Darwin’s ideas, which were wrong.” Rather, they represented the twisting of Darwin’s ideas. Which is wrong. To project them back unto Darwin himself would be to deeply disrespect the moral character of the gentleman abolitionist. It would be just as unfair as chucking out the Bible because it has been similarly misused by slavery apologists and other racists throughout the centuries. Ken Ham is absolutely correct in pointing out that creationism is anti-racist. But his insinuation that evolution is racist is a grave misunderstanding of both the theory and its implications, in addition to being a defamation of Darwin himself — who fought actively against slavery all of his life and argued that, fundamentally, all men are equal. Can’t say I’ve been an avid follower of the former Emperor frontman, but I’ve really enjoyed the twisted experimentation of Ihsahn’s recent forays into progressive metal. It’s very organic, but not pleasantly so – which is what I like about it. It’s really harsh, almost offensive, but precisely that harshness creates the contrast which allows the intermittent beauty to make a special impact. This song is from his most recent album, Das Seelenbrechen (a Nietzschean term, by the way), which was released in October last year. I’ve been a fan of Carpark’s since my best friend and I poured over every single musical detail on their debut album back in 2003. Those were some good car rides. “32” is the first single off their new and long-awaited album, Phoenix, which came out yesterday. I heard the song live last summer and, along with the album, it’s vintage Carpark: Electronically fused very melodic and very dynamic stadium rock. I love the angularity of the opening riff and, of course, the sing-along chorus. The vocals, especially Stine Bramsen’s, are a compelling organic counterpoint to the distorted electronics. Really good. If you get the album, which you should, check out “Phoenix”, the title track, especially. I’ve been obsessed with that riff ever since I heard the song for the first time a couple of weeks ago. And the positive lyrics have really spoken into my life with some of stuff I’m going through at the moment. From their EP Citadels, which can be bought here. I love the interplay between the prog and the rock-out. The guitar-work, especially, stands out. I love the bluesy solo and I love the groove it’s played over. Mandroid Echostar sound what Protest the Hero, featuring the singer (and his hair) from Coheed and Cambria, would sound like on a mild tranquilliser.